Green Doors' Housing Program is focused on creating different types of housing tailored to the needs of residents. Throughout Austin, the organization owns and manages 28 properties, serving more than 300 residents annually, including managing 50 housing rental assistance vouchers for low income households in Travis, Williamson and Burnet Counties. Through these opportunities, Green Doors is able to serve a variety of people struggling with poverty/homelessness, including veterans, persons with disabilities, and single parent families. 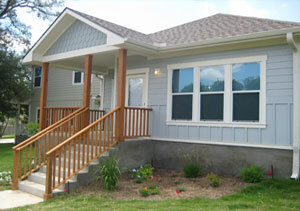 Transitional Veterans Re-Entry Housing. Green Doors provides transitional housing and access to supportive services for homeless veterans, through its Transitional Veterans Re-Entry Housing program. This flagship program serves roughly 60 male and female veterans annually in scattered site houses throughout South and Southeast Austin. Glen Oaks Corner. Green Doors provides permanent housing with supportive services for formerly homeless families at Glen Oaks Corner. Launched in 2008, Glen Oaks Corner is a family focused supportive housing project that serves over 20 formerly homeless disabled adults and children annually. At Glen Oaks Corner, the head of the household for each of these families has a documented disability. While in the program, residents are expected to work toward the goals of achieving greater residential stability, increased income and self-sufficiency. Pecan Springs Commons. Green Doors provides integrated supportive and affordable housing at Pecan Springs Commons. Pecan Springs Commons serves a mix of individuals and families who are at-risk of homelessness or have successfully exited homelessness. It includes 82 one and two-bedroom apartments and extensive public amenities, including community gardens, pocket parks, and green spaces. Treaty Oaks. Green Doors newest development, Treaty Oaks provides integrated supportive and affordable housing to mostly individuals and some families who are at-risk of homelessness or have successfully exited homelessness. It includes 47 apartment homes and extensive public amenities, including community rooms, pocket parks, and green spaces. For more housing and leasing information, please call Green Doors at 512. 469.9130 or toll free 1.866.412.6591. Why is it important to end homelessness? Homelessness is expensive. Not only does it take its toll on people's lives, it is a huge financial burden on society. Tens of millions of dollars are spend each year in Travis County to feed, shelter, medically treat and imprison homeless people. As we move more of these people into housing and employment - and as we help them to become more independent and productive - we will spend far less in emergency services and they will contribute positively to their community and the local economy.